We raise the bar when it comes to modern floor lamps. We have fun and modern styles with funky designs, and sophisticated styles as well. You will enjoy the look and function of our collection of floor lamps from various brands. You can perform daily tasks such as reading, or you can even watch a movie with your loved ones. You can set the lighting to whatever mood you want, and you can do it in a fashionable way. For example, you will like our George Kovacs “George’s Reading Room 1 Light LED Pharmacy Floor Lamp”, which will fit in well with any living room. It also has a very simple design, and it won’t take up too much space in any room. If you’re looking for something that will allow you to adjust the light, then you should take a look at our George Kovacs floor lamps. We have all types of lamps, such as arc lamps, torchieres, and pharmacy lamps. 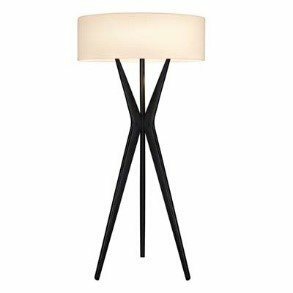 For example, our “Light Arc Floor Lamp with Opal glass” comes with a black base, and it has a brushed nickel finish. It has a modern look with a curved J-shape, which will illuminate any area that you would like to focus on. Additionally, the lamp is dimmable in order to create the look you want in your apartment. Looking for something a little funkier? Our “George Kovacs 1-Light Torchiere Lamp in Chrome” is a good choice. It has a chrome finish and it has a clear and tangerine glass. It will fit in nicely next to your couch, and it will brighten any room. In addition, it has an on/off floor switch, and it has a unique lamp shape. Therefore, it will transform a regular room into a unique area that will turn heads. There are some things to consider when you’re purchasing a lamp. First of all, you should consider how much light you need as well as where you want most of the light to shine. Our torchiere lamps can even direct light upwards—a dream if you want to show off your high ceilings or create a little more unique an emphasis within your space. The next thing you need to do is decide what you would like to use the lighting for. Whether it is for aesthetic reasons, whether you want to light the whole room, or whether you just want to illuminate a small area, our unique selection of lamps will help you serve whatever function. For instance, ET2 Lighting Eco-Task LED floor lamp works as a lighting source, and you can do a number of tasks with it. It comes in a variety of colors to suit your home, too. Our modern lamps will add that little something to any room, and you can check out our website ( www.crescentharbormodern.com ) for available styles.